We have an excellent selection of basket weaving books for every type of basket weaver. Have a lot of pine needles or pine straw? Judy Mallow’s Pine Needle Basketry demonstrates everything you need to know about basket weaving with pine needles. Are Rib Baskets your style? 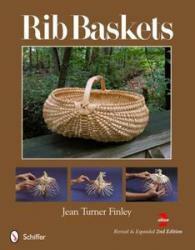 Rib Baskets by Jean Turner Finley has 14 different rib baskets with 231 images and 107 diagrams! Our instructional books are great for beginning to advanced weavers. We also have a full line of classic basket weaving kits. They’re guaranteed to teach and sharpen your basket weaving skills with their fully illustrated, step by step patterns. Sign up for our free e-mail newsletter. Receive a link to download a free pattern today. You can see what we mean! Like Us on Facebook and receive a Coupon Code that you can use for your basketry books today! We have an excellent selection of Basket Weaving Books – instructional, inspirational – great for beginners to more advanced weavers. Click here to go to our Books online store page.